Adding even more weight to the event was the testimony of retired official John Callahan who was, in 1986, the FAA’s Accidents, Evaluations and Investigations Division Chief. Callahan came forward and blew the whistle in 2001, and, came forward with hitherto unknown paper records, video tapes, voice tapes and other material to back up his claims. 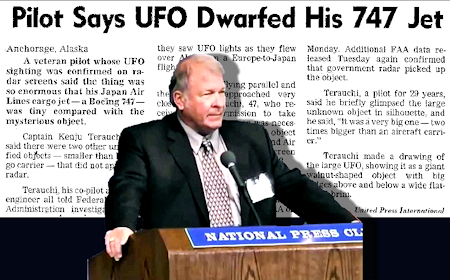 Since then, Callahan has participated in two documentaries, three “disclosure” style conferences, and made numerous statements for researchers concerning his involvement with the JAL 1628 case – and the cover-up of the event, as we shall see. The JAL 1628 case is, to me at least, a key event in UFO history. I have periodically – as anyone who knows me would expect – studied it at some length. One issue key to the case has, however, troubled me for some time: Despite the wealth of information, much of it official record, about this extraordinary event, it seems that no one thus far has been willing or able to actually verify John Callahan’s exact role at the FAA. Some armchair debunkers have even claimed he may even be a fraud. In both this post, and a sequel, I shall present an appraisal of Callahan’s employment with the FAA, and the various high level positions he held in the late 1980’s. Through substantial digging, plus lengthy discussions with Callahan himself, I am now entirely satisfied with his public statements and assertions. For those who are unfamiliar with John Callahan’s side of the story, the long-and-the-short of it is this: Firstly, no one in FAA officialdom outside Alaska was aware of the incident until the pilot of the JAL flight, Kenji Teriuchi, decided he would no longer stay silent. In early-December, weeks after the UFO encounter, Teriuchi contacted the huge Kyoda News Agency for a private meeting in his London hotel room. Kyoda subsequently contacted the FAA’s Alaska Region Headquarters on the 24th of December. They were informed by an off-guard Public Information Officer at Anchorage, Paul Steucke, that a UFO event had indeed taken place. Throughout the last days of December and throughout January, 1987, the story exploded across the worlds press. As this played out, Alaska Region HQ contacted John Callahan, who, as stated, was the Division Chief of Accidents, Evaluations and Investigations in Washington DC. Callahan had been entirely unaware of the UFO incident and told the Alaskan FAA officials to inform the media, and anyone else who came knocking, that “the event was under investigation”. Callahan further asked Alaska Region to forward the relevant data to the FAA Technical Center in Atlantic City, where he and his superior, Harvey Safeer, analysed the evidence, and, most importantly, played back the radar data on a Plan View Display. The radar data was matched in with the voice tapes of the conversation that had occurred between the pilot and Air Traffic Controllers from both the FAA and the USAF. This playback and tie-in was filmed on a video recorder for later use. Moreover, the same CIA staff instructed Callahan that they were taking all the data, the paperwork, the video tape, any-and-all material that the FAA had accumulated. What no one knew was this: Callahan kept copies, in some cases originals, of everything, including the primary radar target printouts, the video tape of the first analysis on the Plan View Display, the pilots report, the first FAA report, first generation copies of the voice communications tapes, etc. Callahan has allowed serious researchers to study this material, and is willing to further testify that all of what he, and his documented evidence, says is true. As I mentioned at the beginning of this post, John Callahan’s employment history and career credentials, especially his claimed role as Division Chief of the FAA’s Accidents, Evaluations and Investigations area, have barely, if at all, been verified. I wished, this year, to change that. 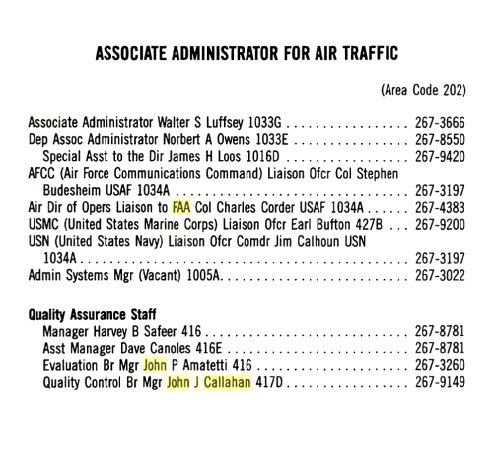 Without detailing every investigative step, I have variously searched for records – in US Government directories, FAA press releases, etc both the existence of a John Callahan ever being at the FAA in the 1980’s, and, the existence of an “Accidents, Evaluations and Investigations” branch or division within the FAA in the 1980’s. Worryingly, only a handful – and by that I mean literally four – referances came up for a John Callahan being at the FAA, and none of them really matched his claimed “Accidents, Evaluations and Investigations” area. In fact, all I could find was a John Callahan who was “Quality Control Branch Manager” of the “Quality Assurance Staff” under the “Associate Administrator for Air Traffic”. Below is a capture of one such listing. Not knowing how to track down Callahan directly, on the 10th June this year I got in contact with author and journalist Leslie Kean who has spoken to him at length. The JAL 1628 story appears in Kean’s excellent book “UFOs: Generals, Pilots, and Government Officials Go on the Record” Luckily I had been in contact with Kean previously, so it was not an issue for me to ask her for a favour: Get Callahan to contact me, and iron this FAA employment issue out once and for all. Within a day, she got back to me and indicated that she would ask Callahan if I could contact him. He was agreeable to this, and on the 12th of June I introduced myself via email, and outlined some of the questions I would be presenting him in the future. Over the next few months – and indeed even to this day – Callahan and I have been in contact, and we have covered a lot of ground regarding his role at the FAA and the infamous Japan Airlines 1628 case itself. In my next blog post I will detail, with documentation, Callahan’s FAA career; especially during the mid-1980’s when the UFO event occurred. For now, a teaser – I am entirely satisfied that Callahan is the real deal, and hopefully all of you will be too.